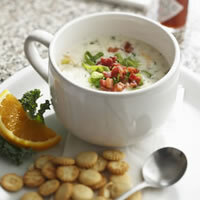 Clam chowder was a strange food to me as a young adult. Mom had never made it. After all, clams don’t grow in the US Midwest! lol Discovering it as an adult was wonderful. And then we ate it in Boston in a bread bowl in Fanneuil Hall. Heaven! Anyone can make clam chowder with canned clams. Enjoy it with some crusty bread or cheese crackers, like Goldfish crackers or Cheez-Its. This particular recipe is a healthy one that you don’t have to feel guilty eating. Amazingly a serving is only 180 calories. Great diet recipe! Click here for this recipe at Delish.